Yet the industry has proved highly adaptable in past crises. With all the attention paid to the goods and services targeted in the trade war between the United States and China, it’s easy to overlook the damage the conflict will inflict on the transportation industries that facilitate trade – namely, global shipping. Maritime shipping is especially vulnerable, considering some 80 percent of all world trade is transacted by sea, so it is little wonder that companies have already begun to prepare. And the ways they do so will tell us a lot about how the trade wars are changing global trade patterns. The shipping industry is, notably, already accustomed to change. Volatility is practically baked into its business model. The price of fuel – which currently accounts for roughly 15 percent of operating costs – is constantly in flux, formed by dozens of factors beyond shippers’ control. Wars and blockades can impede access of cargo ships. Overcapacity is an endemic (albeit cyclical) problem, to say nothing of the normal ups and downs of any business environment. In other words, the only constant is unpredictability, and the industry has always had to reinvent itself accordingly. Well, “always.” Seaborne trade is nearly as old as trade itself, of course, but global shipping as we know it today didn’t really take off until the 1960s, when companies around the world standardized the industry. Once shipping containers and equipment were uniform, shipping boomed. But as is so often the case, the boom created a bubble, and the bubble burst. Companies responded by creating large conglomerates, but while the physical infrastructure of the industry had been standardized, rates had not, and each tried to exploit discrepancies to their advantage. Surveying the damage done, shippers finally harmonized container rates. More booms and busts would follow, the most notable of which came in 1973, just a few years after the debacle of the 1960s. That year, Arab oil exporters famously enacted their embargo, driving the price of oil skyward. High oil prices dramatically raised the cost of fueling cargo ships, and by 1975 maritime trade had dropped by 6 percent, the first decline the world has seen since World War II. The coming trade wars, then, were always going to be difficult for shipping companies to navigate, but the situation is compounded by poor timing. The 2008 global financial crisis gave way to an industry crisis from which shippers are only starting recover. In the mid-2000s, maritime transport companies began to prioritize capacity per vessel. The planned expansion of the Panama Canal and rising oil prices compelled companies to build larger-capacity ships that could more efficiently move cargo. From 2005 to 2015, the total capacity of containerships increased from 8,000 twenty-foot equivalent units – the overwrought measurement of cargo capacity, mercifully abbreviated as TEUs – to 20,000 TEUs. Companies started construction early, knowing that it would take some time to build bigger ships. Capacity increased, but global demand for goods, which had slowed in 2008, couldn’t keep up. Yet industry experts are relatively optimistic about the future. Drewry, a leading maritime research consultancy based in the United Kingdom, created a (highly unlikely) scenario in which the U.S. placed tariffs on $450 billion worth of Chinese goods. The study concluded that, assuming China reciprocates, the trade war would affect only 1 percent of total global shipping and imperil 7 percent of U.S.-bound cargo from Asia. 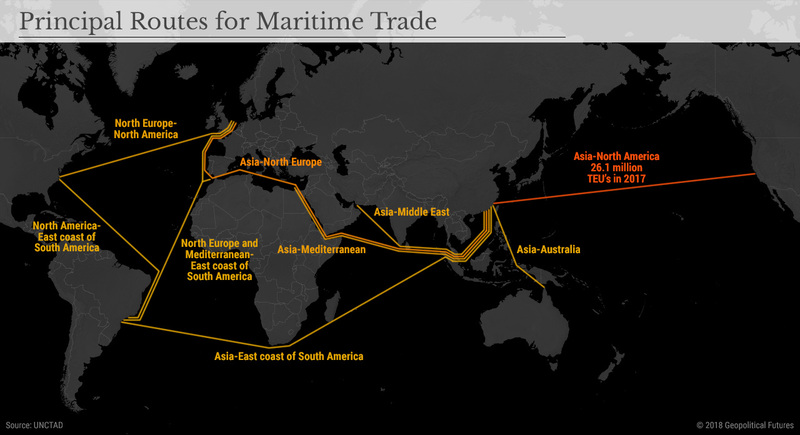 In terms of tonnage, the U.S. tariffs on China would affect 200,000 TEUs but could climb to 1.8 million TEUs in due time. Any industry that turns a profit from moving goods from one place to another will balk at the prospect of protectionism. Global shipping is no different. But it’s not as if the trade war will destroy the industry. It’ll just adapt to its environment, much like it always has, traversing new routes to and from new countries that some government is buying from now that markets elsewhere have been cut off. In that sense, it’s a useful tool for analysts looking for the trend that has not yet emerged from the trade wars.